and the related number- or volume-weighted size distribution. Figure 1. 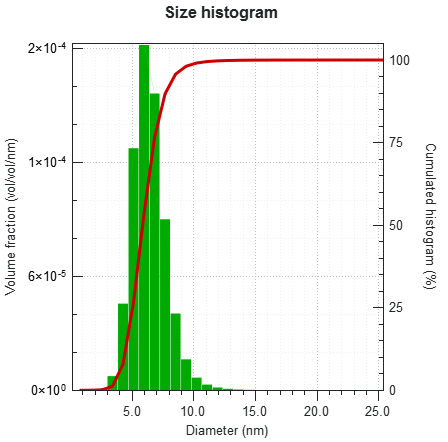 Size distribution of silver nanoparticles in aqueous suspension as obtained from the analysis of SAXS data acquired on the Nano-inXider with XSACT software. The availability of the scattering intensity in absolute units enables the accurate determination of volume fractions. The histogram is normalized with respect to the bin size. Cumulated values are displayed to facilitate the readout. 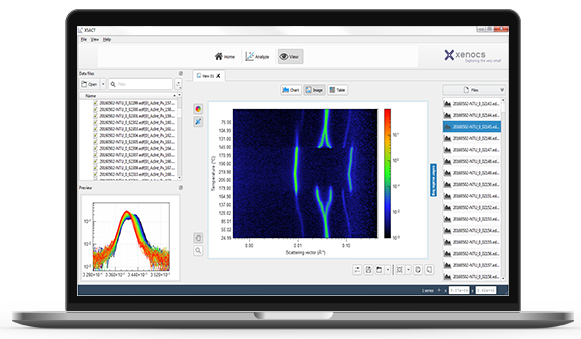 XSACT analysis software implements the above methods and standards. Why use SAXS for measurement of particle size & size distribution ? Exceptional resolution power even for smallest nanoparticles and bimodal populations. Reliable statistical properties due to ensemble averaging. Minimal sample preparation is required. You can work with a wide range of concentrations and samples, even on opaque suspensions or dry powders. No dilution step is required. With SAXS, you can do in situ and dynamics studies.